CM readers get 50% off FXpansion Guru! 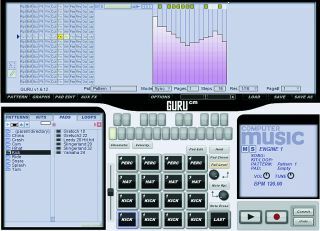 If you're been enjoying Guru CM, available only on issue 155's cover DVD, you'll no doubt be interested in picking up the full version of this amazing virtual drum machine, which includes tons of extra sounds and audio engines, amongst other things. Well now's the time to take the plunge, because FXpansion //link// are offering an upgrade to the full version for an absurdly bargainous £64.00/€99.00/$124.00 - a whopping 50% off the retail price. To take advantage of this offer, simply register your Guru CM serial number and you'll receive an upgrade offer via email direct from FXpanion. It's a truly superb piece of software, so get your copy of CM155 while you still can from www.myfavouritemagazines.co.uk.